Today is Friday, and the last trading day in March. The markets are mixed up. This situation is likely to continue next month. Gold: The gold market seems exhausted. 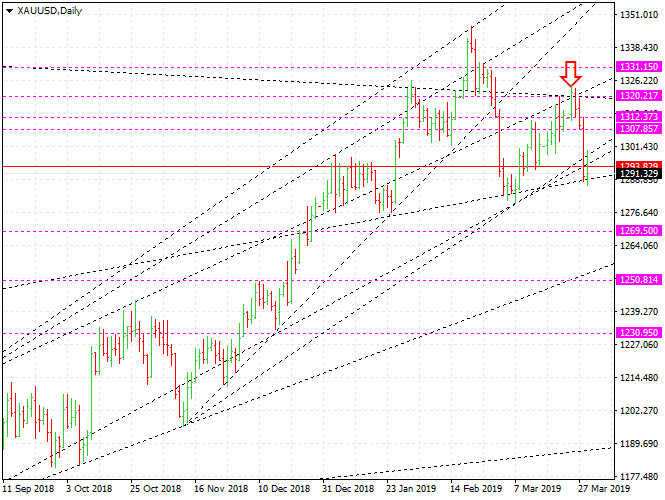 XAUUSD is likely to drop a little more. $ 1269 and $ 1251 will be support lines. For a while, they are likely to move between $ 1250 and $ 1307. I will wait for a safe opportunity to enter the market. The silver reached the support line of $ 14.95. XAGUSD does not rebound strongly. That means XGUSD will drop a little more. $ 14.68 is likely to be a support line. I will hold the sell - position. For a while, the silver market seems to be noisy. WTI: The oil market is still hot. It seems as if the oil is on fire. Brent oil will go up to $ 75.3 and WTI to $ 63. It would be better to do buy-trading. Euro: It is a very difficult time to trade the euro. EURUSD is likely to move between 1.1173 and 1.13. EURUSD is on a downward trend in the long term. SP500: Stock indexes seem to have been injected with muscle tonic. Dow Jones index futures attract our attention. 26100 is a very important level. Stock indexes do not look good. The most important price for the Dow Jones is 26100, and for the SP500 is 2902.